The last romantic-comedy drama I got addicted to was Full House and it's been a long long time ago since I watched one from the first to the last episode. I have heard about this drama early this year and how much this drama caused such a craze not only in Korea but in other neighboring Asian countries particularly in China. The truth was, I had initial misconception about the drama that I didn't check it out even when it started airing in my country last April. Though I was curious-it was not enough for me to tune in to my TV set every night to watch. I think this could be due to the fact that I'm not really into the "alien" stuff and I was busy with work. A month ago, I had some free time and work load was way much lighter than I have since last year. By this time I got so curious about the series as its craze in other neighboring countries has reached fever pitch. I downloaded the app DRAMOT+ on my Galaxy Tab and started watching this series. I got addicted. One of the things that didn't make me watch this series at first was that I have a misconception that Jun Ji Hyun was somehow reprising her Sassy Girl persona which I don't think I would want to see her do again-I mean she did it in My Sassy Girl and Windstruck and I just thought that there's nothing new to expect thus the lost of excitement for this series. While I love Sassy Girl, Windstruck was kinda too long and a lot of parts where a bit boring and later got tired of the sassy girl persona that JJH played. I 'm glad managed to put aside my initial misconceptions and got really surprised. First of all, the "alien" aspect wasn't corny to begin with-it's kinda like Smallville during it's first 3 seasons. Kim Soo Hyun played the role of Do Min Joon really well. It's still like the typical Korean Male lead- strong, assertive and aloof but what was amazing about his portrayal was that he was able to give a strong sense of maturity to the character that even if his face looks so young-you'd actually believe that his character is 400 years old. 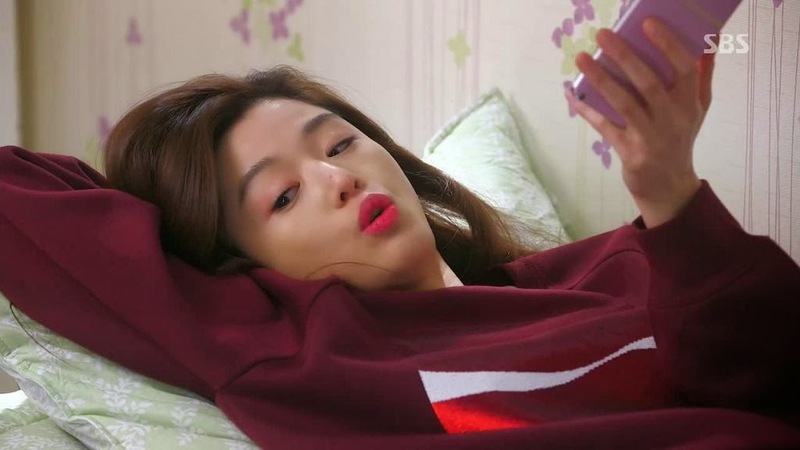 Second, JJH was very successful in playing a bitchy actress without turning off the audience and even if she's like that it still made her character lovable and feel for her when Do Min Joon tries to push her away. I was worried that I'd be watching the same JJH I saw in My Sassy Girl and Windstruck but her character as Cheon Song Yi was different. Unlike in her old films where she plays the "tomboyish" girl next door, she was turned into a "girly" glamorous actress and managed to carry the clothes so well that her fashion was often recreated or copied but women. One of the stuff I really took notice of are her headbands. I'm a headband collector ever since Blair Waldorf and continued to Adelaide Kane's headpieces in Reign and now JJH. I love the simple ones but I don't think I can carry wearing the "bunny" ones. Though I think that style was popular for a brief period of time. When I first heard that this Lipstick she supposedly used for the show, YSL #52 in Rosy Coral got sold out everywhere and some being sold 3x their original price I got curious. I can't afford to shell out that much money then for one because everywhere I looked online they were selling at a minimum of USD $60 which I think is too much for a lipstick. The color does brighten's one's complexion and so I search for local brands for dupes. Personally, I think Maybelline's MAT 02 is closer to YSL NO 52 when applied but it's a tad bit lighter compared to YSL 52 while NYX's Femme looks closer in this swatch-well I guess it depends on one's acidity level. When everything I bought seems like it's not right-the price of the lipstick lowered to an affordable price. I managed to get one from an ebay auction at just USD $30+ recently. Among the lipsticks I bought- the closest would be Maybelline. YSL is a bit darker but nevertheless, the shade is almost an exact copy. As for her red lips, it's hard to find Iope in here and I was able to buy again from Amazon, a special Maleficent limited edition lipstick True Love's Kiss. For the ordinary filipina, a much affordable version would be in2it's LA 10 Crimson or NYX's Snow White. I was fortunate enough to be one of the few to take part in a training for career advancement early this month. We had to attend a one week training. I went to Manila 2 days earlier so that I'd be able to spend time with my sister to shop and sight-see. It was a bleak Saturday morning and I just wanted to visit stores and shop. We didn't want to go that far from Makati where we stayed so we went to Glorietta, Greenbelt and later Rockwell. When we went to Korea I bought Missha's Art Designing Moisture Boomer- and I regret not hoarding it. It's one of the best I've ever tried. It especially works well with bb cream. I love how it gives a very natural dewy effect without my face being too oily after a few hours. I can blend it with my Laneige Snow BB or my Skinfood Vita Tok water pact. I have tried Etude House's Nymph Aura Volumer but it often leaves me very oily looking after a 3-4 hours even if I have dry skin. Last December I looked for it in all local Missha counters but there wasn't anything available. This time, I went to Rustan's makati and was able to buy Missha's Real Complete Blending Primer and it's quite expensive but I tested it and the texture feels the same as the Art Designing Moisture Boomer but this one has wrinkle-care and whitening. I also ran out of primer. 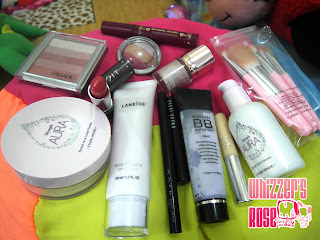 I use either Tony Moly's baby doll make-up base in violet or The Face Shop's Lovely Primer me:ex also in violet. Unfortunately, our local Tony Moly and Face Shop stores here in Davao have no stock. I was able to find some at their Rockwell branch. The only stuff I wasn't able to restock was their Jelly Tint-I don't know if this product has been discontinued-hopefully not. I also got my Tony Moly Moon Beam Highligther. I tried out Etude's primer that has a sponge on it and I really didn't like it as much as Tony Moly's or The Face Shop's. powder or IN2IT powder for a dewy finish. At the Landmark- I splurged on cheap kabuki brushes. I just love how soft they are-they are synthetic by the way-I don't have a sensitive skin so it's ok for me to use these brushes. I understand that there are people with sensitive skin who are quite allergic to synthetic brushes.